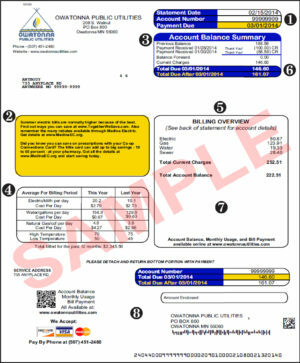 For helpful hints in understanding your bill, please view this file. Below are some common terms used on the bill for your information. Monthly Service Charge: This is a basic charge to help cover the costs of maintaining utility service, such as transformers, substations, meters and account administration. Commodity Charge: The amount of electricity, water and/ natural gas used during the billing period. One kWh of electricity is equal to 1000 watt hours and will power a 100-watt lightbulb for 10 hours. One CCF of water is equal to 748 gallons. One CCF of natural gas represents the amount of natural gas contained in a space equal to 100 cubic feet. Energy Acquisition Adj. : The energy acquisition adjustment (EAA) is used to adjust the retail price of electricity to cover wholesale electricity fluctuations. It is calculated on a per kWh basis using the difference between the actual price of electricity and the price that was assumed when the base rate was determined. It can be a positive or negative amount. Load Management Credit: As a participant, a 5% monthly credit on electric commodity billed is provided. The Load Management Program provides OPU the ability to manage air conditioners on days of high electrical usage. Energy Conservation Inv. : This funds the electric and natural gas conservation programs and is included in the rates. These funds go back to the community in the form of rebates to encourage electric and natural gas conservation. Minnesota Sales Tax-Electric & Minnesota Sales Tax-Gas: Current Minnesota State Sales tax for natural gas, applicable May – October. Steele County Tax-Electric & Steele Sales Tax-Gas: Current Steele County Sales Tax for natural gas, applicable May – October. MN Dept of Health Water Fee: Required by the U.S. Environmental Protection Agency which funds the required testing for drinking water. Water Service Line Protection Program – Fee: Program fee that provides homeowners with protection from many of the unexpected cost of water service line repairs. This is an optional program and customers can “Opt Out” at any time. City of Owatonna Sewer Base Charge: Based on the size of the water meter at a location. City of Owatonna Sewer Commodity Charge: Every year in February, the consumption is recalculated. The commodity charge is based on how much water was used during the months of December, January, & February. For additional questions on the calculation, please contact the City of Owatonna at 507-444-4350. City of Owatonna Run Off Fee: This is a location’s portion of rainfall that is drained into the storm sewers or storm drains. The fee is set by the City of Owatonna yearly and is calculated in part by using the size of the property. For additional questions on the calculation, please contact the City of Owatonna at 507-444-4350. Purchased Gas Adj. : The purchase gas adjustment (PGA) is used to adjust the retail price of gas to cover wholesale gas price fluctuations. It is calculated on a per CCF basis using the difference between the actual price of natural gas and the price that was assumed when the base rate was determined. This can be a positive or a negative value.